There are currently 117 people online. MSI will launch the 15.6" X-Slim X620 laptop at CeBIT, this system features a 1366 x 768 pixel resolution, Intel GS45 + ICH9M-SFF chipsets, Intel Core 2 Duo SU7300/SU4100 processor, Windows 7 Home Premium, ATI Mobility Radeon HD 5430 1GB GDDR3 graphics card, up to 500GB HDD, DVD burner, SD/MMC memory card slot, HDMI, eSATA, 8-cell battery, 1.3MP webcam, 802.11b/g/n WiFi, and Bluetooth 2.1. The laptop measures 392mm x 255mm x 36.3mm and weighs 2.41kg. Leader in organic design: The core idea behind the overall design of MSI's X-Slim X620 is environmentalism. The X620 boasts superior video capabilities, including Intel's high performance Core 2 Duo, an internal DVD drive, an ATi Mobility Radeon HD 5430 3D discrete graphics card (1GB DDR3 VRAM), and a 15.6" 16:9 ratio LED backlit display with Amazing Crystal Vision technology. In addition, it has a trend-leading natural organic design created by MSI's own design team which has received numerous awards for its achievements. Natural design elements: Classical elements from nature, such as a mineral grain pattern and a unique rhombic color film print pattern, are incorporated into the X620's exterior to add texture. In a first, MSI incorporated the minimalist pattern onto the areas around the screen and keyboard, using the latest chemical-free pigment technology to highlight this notebook’s natural theme and panache. Recipient of iF Product Design Award: Like other members of the X-Slim Series, the X620 is designed to be slim and light and is graced with feather pattern lines. It is also trimmed in silver to underscore its unassuming elegance. The distinctive and practical chiclet keyboard accentuates this high performance laptop's slender, lightweight body. The X620 received Germany's iF Product Design Award for 2010—the design world's equivalent of an Oscar. Superior performance, long battery life: Not just another pretty face, the X-Slim X620 boasts top-notch performance. 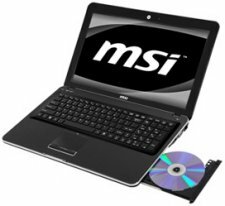 Its Intel Core 2 Duo sips power, runs cool, and offers the best processing power in an ultra-slim laptop. It can run several applications without being dragged down. Coupled with MSI's exclusive ECO Engine Power Saving Technology, its 8-cell battery can provide up to 11 hours of power. You can't find a better more mobile business partner. * Actual battery time will differ depending on settings and how the computer is used. Ultimate cinematic experience: The X-Slim X620's superior processing power makes it the ultimate machine for film viewing. Equipped with the ATi Mobility Radeon HD 5430 advanced 3D discrete graphics card (1GB DDR3 VRAM), an ultra slim internal 9.5mm DVD Super-Multi Drive, and the 16:9 ratio cinema-quality Amazing Crystal Vision LED backlit screen, the X620 offers true-to-life pictures with sharp colors and crisp pictures. The SRS Premium Sound™ rounds out the cinematic experience.